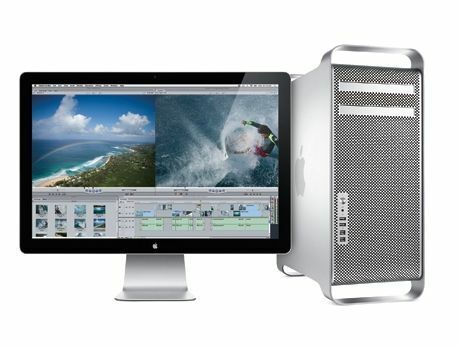 The entry-level mid-2010 Mac Pro gives us little cause for complaint. A Blu-ray drive would be welcome but was never on the cards, and it's expensive, but not poor value for money. It's great to see that even in the midst of a recession, Apple isn't neglecting its high-end range. Apple's mid-2010 refresh brings us three new models of the Mac Pro – the top-of-the-range tower format Mac aimed at professionals and high-end users. The one we're reviewing here is the entry-level model at £1999, based around a 2.8GHz quad core Intel Xeon processor using the 45nm Nehalem microarchitecture. If you need even more processing power, the mid-range Mac Pro sets you back £2,799 and features two 2.4GHz quad core Xeons based on the Westmere 32nm process. If you're really ambitious (and rich), the top-of-the-range model costs £3999, and boasts twin six-core 2.66GHz Xeon Westmere processors, for a total of 12 cores. Naturally, if you order online, any and all of these machines can be customised. The entry-level model reviewed here can be boosted to a 3.2GHz quad-core CPU or a six-core 3.33GHz chip, though if you really want to spend some money, go for a top-of-the-range model with twin 2.93GHz six-core Xeons. This particular Mac Pro comes with 3GB (three 1GB DIMMs) of DDR3 ECC SDRAM at 1066MHz, but its four memory slots can support up to 16GB. The two-processor models are supplied with 6GB of memory out of the box, but offer eight slots for up to 32GB in total. The top-of-the-range Mac Pro also uses faster, 1333MHz SDRAM. Processor and memory aside, the three models brought to us with the Mac Pro's mid-2010 refresh have a lot in common. They all have a 1TB SATA hard drive running at 7200rpm; a ATI Radeon HD 5770 graphics card with 1GB of GDDR5 memory, offering two Mini DisplayPort outputs and one dual-link DVI video output; and an 18x dual layer-compatible SuperDrive for optical discs. Each has two USB 2.0 ports and two FireWire 800 ports at the front of the machine, plus three USB 2.0 and two FireWire 800 at the back, where you'll also find dual 10/100/1000BASE-T (Gigabit) Ethernet ports. Wireless-N is catered for, as is Bluetooth 2.1.